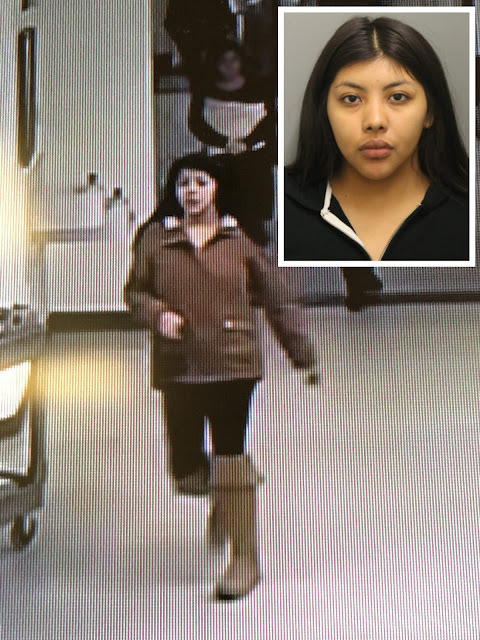 An accused robbery offender who has been missing from electronic monitoring since September is on the loose again after she slipped out of handcuffs and escaped from the Leighton Criminal Courthouse at 26th and California this morning, a Cook County Sheriff’s Office spokesperson confirmed. Alicia Gines, 19, had been taken into custody this week and Judge Thomas Gainer Jr this morning ordered her to be held without bail. Gines was handcuffed in a holding area waiting to be transported to jail when she slipped out of her restraints and made a dash for the courthouse door at 10:41 a.m. She hasn't been seen since. Gines was charged in September 2017 with battering and robbing a woman of an iPhone in the Pilsen neighborhood. She was released on electronic monitoring to await trial, but went AWOL on September 12th this year, according to court records. An additional charge of escape was filed against Gines in September and she managed to remain on the loose until this week. Last year she told police that she was a student at Malcolm X College. Anyone who spots Gines is asked to call 911.